Transpose can be used to work with your model in various ways. To read about the main Transpose controls see the Posing Your Model >Transpose page. When you switch to Move, Scale or Rotate mode to use Transpose, your brush is automatically changed to a Transpose Brush. You can select a different Transpose brush from the Brush palette. 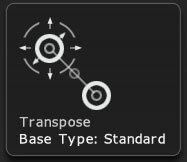 When selecting a new TransPose Brush (such as Transpose Smart Mask) it becomes the default TransPose brush and will be reactivated any time you return to TransPose until such time as you select a new TransPose Brush mode. To position the Transpose line so that it starts at the center of the visible part of the mesh, unmasked region or current polygroup, click the white ring that is at the further end of the line. The TransPose Smart Masking feature must be selected in the Brush palette and doesn’t have the same behavior as the default TransPose Action Line as it is used to create a Mask based on the object’s curvature. Smart Masking easily detects areas of the model by analyzing its surface. To use it, simply hold the Ctrl key while dragging the Action Line. A short TransPose line will have a low detection of the surface’s curvature, perfect for small areas and complex shapes. A long TransPose line will have a higher tolerance, making it the best solution for large areas with distinct borders. You can combine different Masks in the same action by pressing the Shift key to add a Mask to the previously created one. Like with all Mask operations, you can use the ALT key to unMask the existing Mask. The TransPose Action Line can bend only the portion of your surface that is located between the two furthest circles of the action line. Begin by applying an Action line. Make sure that you are in Move mode. Next, hold the ALT key and drag the Action Line’s center circle to bend surface. 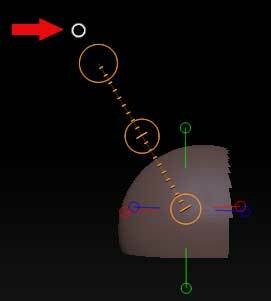 While moving your cursor the Action Line will be temporarily hidden so that you can clearly visually see and control the deformation. Quickly deform your models with the TransPose line. The deformation is controlled by the position of the TransPose line and its Curve settings. The deformation is modulated by the Brush curve settings, located in the Brush palette. When you need to add more topology by creating an extrusion, use the TransPose line combined with masking. Activate Move mode to turn on the Action Line and then hold the Ctrl key when clicking on the line’s center circle. This will extrude all non-masked parts of the model.. This operation will only work with a model that does not have subdivision levels. However the Freeze SubDivision Levels button (explained elsewhere in this documentin the Added Functions and Changes chapter) can be used to temporarily drop to the base mesh level and extrude the mesh, then return to the highest level and re-project its details. Ensure that your model is a Polymesh 3D or a DynaMesh. This function will not work with primitives or ZSpheres. Create a mask on your model. These masked areas will remain unaffected while the unmasked areas will be extruded. If you wish only to extrude a small area, a good tip would be to mask the area you want to extrude, then invert the Mask before performing the next steps. Activate the Move TransPose mode (W hotkey) and draw an action line out from your unmasked area. While holding the Ctrl key, click and drag the white circle located within the Action Line’s orange middle circle. This will move the entire Action Line in the direction of your movement and at the same time will extrude the unmasked polygons. When you release the mouse button (or lift the tablet pen), ZBrush will update the mask to include the new geometry created by the extrusion. This allows you to continue the extrusion without needing to manually update the mask. When done, clear the mask. Note: If you wish to create symmetrical extrusions on both sides of the model you must first activate the Local Symmetry mode. This is done by pressing the LSym button located in the Transform palette or on the right Shelf next to the canvas. When no portion of the model is masked, holding Ctrl while using the TransPose Line in Move mode will duplicate the mesh. An example where this is quite useful is when using the Insert Mesh brushes. This action requires a polymesh or DynaMesh with no subdivision levels. (The Freeze Subdivision Levels feature can be used to prepare models that have subdivision levels.) When duplicating with the TransPose Line, ZBrush will simply add the new mesh to the already selected mesh. It will not create a new SubTool. If your SubTool is an assembly of different independent meshes, you must first fully mask any meshes that you don’t wish to be duplicated. Start with the Dog Project or a DynaMesh. Activate the TransPose Move mode (W hotkey) and draw an Action Line. While holding the Ctrl key, click and drag the white circle located within the Action Line’s orange middle circle. Simply move the TransPose line anywhere across the screen’s working plane to duplicate the current mesh. While a polymesh or DynaMesh is in Edit mode, select one of the Mesh Insert brushes. Use the Brush >> Modifiers >> Mesh Insert Preview to select the object that you wish to insert into your SubTool. Click and drag on the model to insert the new mesh onto the original one. To duplicate the inserted mesh, mask all elements which you do not want duplicated. Using the option explained above for quickly masking by PolyGroups is an easy way to mask everything except the newly inserted mesh. Switch to the TransPose Move mode (W hotkey) and draw an Action Line. While holding Ctrl key, click and drag the white circle located within the TransPose Line’s orange middle circle. You can freely move the TransPose line to duplicate the unmasked mesh and position its copy. 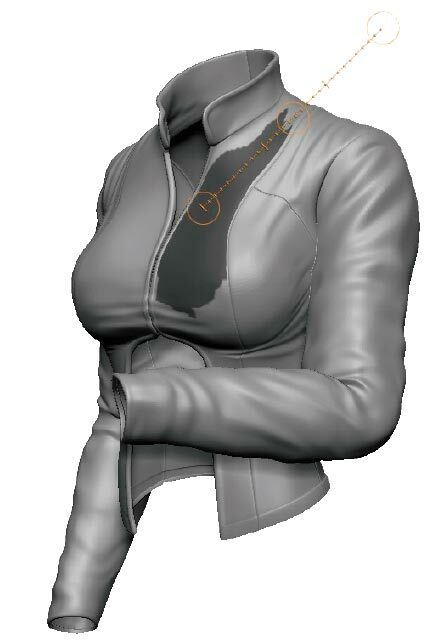 Upon releasing the mouse button (or lifting the tablet pen), ZBrush will update the mask to leave only the new copy unmasked. This allows you to continue creating and positioning duplicate instances of the inserted mesh without needing to manually update the mask. When done, clear the Mask. Notes: Be very careful when masking your model to perform this action. If any portion of the model is missed — like a part hidden by another mesh — performing the copying action will instead create an extrusion. We strongly recommend using the new way to easily mask by PolyGroups. This will ensure that no points are missed. The steps to create a negative copy with TransPose are the same as for duplication. The only difference is that you hold Ctrl+Alt when dragging the Action Line by its middle white circle.